The DonJoy Spider Elbow Pad Sleeve is designed with a unique honeycomb structure that contours to your elbow, providing maximum cushioning and comfort. This low-profile elbow pad sleeve is made of high impact-resistant foam which provides protection during contact sports such as volleyball, basketball, hockey, and football, as well as job related activities. 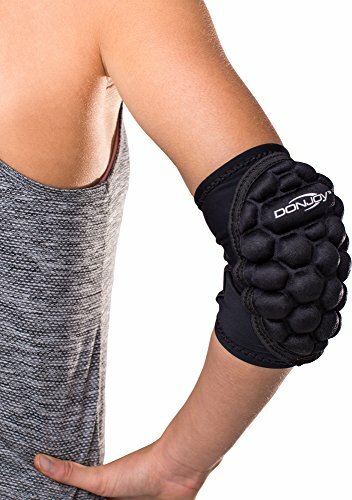 The DonJoy Spider Elbow Pad Sleeve is anatomically designed, so it's less likely to shift around while you play sports and participate in other physical activities. Breathable lycra material provides a comfortable fit, even during periods of extended wear. The stretchable fabric allows you to easily slide it into place, eliminating the need for Velcro adjustments. Universal fit allows the DonJoy Spider Elbow Pad Sleeve to be worn on either the left or right arm.